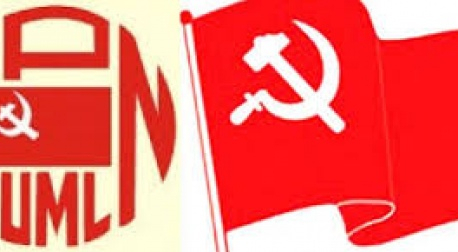 KATHMANDU, May 18: The CPN-UML and the CPN (Maoist Center), two communist parties leading a coalition government at the center and six of the seven provinces, have officially become one, in a historic move that is expected to deepen the left’s grip on the Nepali politics. 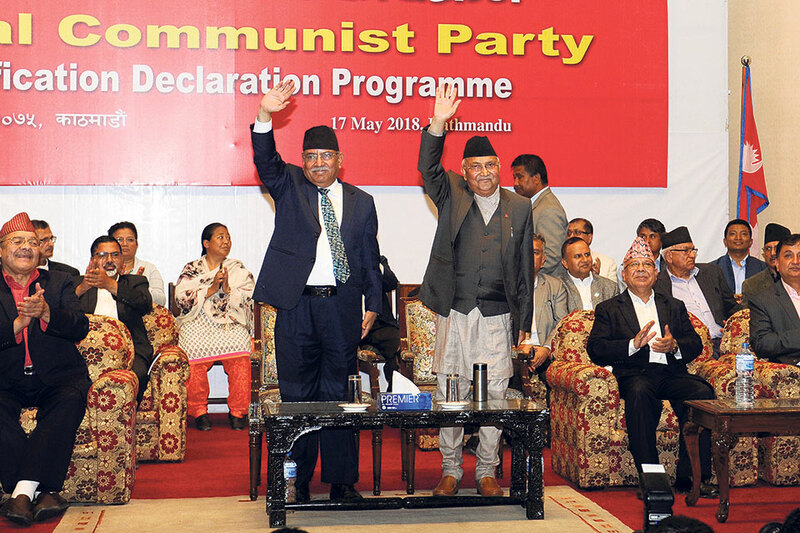 A day after UML Chairman and Prime Minister KP Oli and CPN (Maoist Center) Chairman Pushpa Kamal Dahal finalized a modality of power sharing, the two parties on Thursday dissolved their respective central committees before merging into a single political entity -- Nepal Communist Party (NCP). The party was registered with the Election Commission on the same day. Announcing the new party amid a special function organized at the Rastriya Sabha Griha in the capital on Thursday, Oli and Dahal described the unity as ‘a historical necessity’ that would usher Nepal into an era of political stability and economic development. “This unification is against poverty and backwardness. We would now work toward turning Nepal into a developed country,” Oli said, addressing hundreds of party workers present at the Rastriya Sabha Griha. Oli said that the party would not be excused if it fails to deliver on the promises of economic development. Dahal said that both parties had put aside small differences for the sake of political stability in the country. “This is unprecedented and the most dynamic step taken so far in Nepal’s political history. This will give power to all Nepalis to live a dignified life,” said Dahal. During the function, UML senior leader Madhav Kumar Nepal, one of nine members in the central command or headquarters formed on the day, had read out the manifesto of the new party. The party statute and political document would be disclosed after it is revised in line with Wednesday’s understanding reached between the two parties. Hours before the announcement, Dahal and Oli administered oath to 441 central committee members including 44 standing committee members of the new party. UML and Maoist Center have 241 and 200 members respectively in the new central committee. The organizational structure of the two parties would be integrated within the next three months, according to Dev Prasad Gurung. The party committees and sister wings would be integrated based on 55:45 ratio. The merger, dubbed as the biggest political marriage in Nepal’s history, was sealed through a series of decisive meetings held at various levels since the two sides first announced merger in October last year. But the major breakthrough came one-on-one meeting between Oli and Dahal on Wednesday wherein the two leaders agreed on a common modality of power-sharing. The understanding reached between the two leaders was endorsed through a meeting of the party unification committee on Thursday. The party would adhere to Marxist-Leninist philosophy and adopt “People’s Democracy” as the political line. The statute of the new party would give due regard to the “people’s war” for its contribution in historical political achievements including secularism and federalism. The party has chosen sun its election symbol. The first general convention, which is to be organized within a year, would decide the fate of People’s Multiparty Democracy and People’s Democracy of the 21st century, respectively the political line of the UML and Maoist Center. On the issue of leadership, both Oli and Dahal will have equal strength in the party. Dahal will be nominated consensus chairman of the party after the first general convention, while Oli will lead the government. If there is no consensus on the proposal, the two leaders would rotate at the helm of government and the party. Prime minister’s chief advisor Bishnu Rimal said that the first general convention would decide all portfolios through consensus. The NCP, with a total of 213 parliamentarians in the 344-member bicameral parliament, is likely to remain a powerful force in Nepali politics for a long time to come. On the political front, it has warranted a left government at center and six provinces for a full five-year term. A five-year government is expected to bring much-needed stability, paving up ways for economic growth.